Today’s breaking news story about a clutch of Republicans who defied reason and protocol by sending a letter to Iran’s leaders without Congress, the Senate, or the President’s sanction is accompanied by an ad for Viagra. 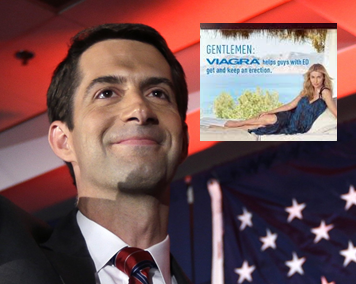 When I opened my tablet computer this morning the Washington Post had a photo of Tom Cotton, an Arkansas Republican Senator–one of the 47 who signed the letter–flanked by the American flag and an ad for Viagra. Look into Viagra, the blonde model says. Viagra helps guys with ED get and keep an erection. The French philosopher Jean Baudrillard would clap his hands with delight. Baudrillard loved the ridiculous in politics and media, and he would write about the connection between the Republicans’ power play and the playful ad to increase male power. Our Yankee idioms reflect power by deploying genitalia in robust ways. Consider the rogue action on the part of Republicans in an idiomatic vein: They have balls. They stuck it to Obama. They screwed the Democrats. Today, students in my college course will discuss how mass media inform us by presenting information in a framework. The framework for today’s Iran letter-writing story includes an image of a smiling Senator wearing a blue, white and red tie; an American flag; a Viagra ad with a woman leaning against a pillow and gazing at the viewer; a bold headline: GOP letter to Iran deepens White House ire; and a few sidebar paragraphs that lead to more news about politics, including Hilary Clinton and the fictional House of Cards episodes. Framing is more than the news story itself: framing enfolds everything we experience as part of the story, from the symbols to the placement on the page—or tablet. Baudrillard would muse we conflate facts with fiction and the market when a news story meshes an actual occurrence (the letter-writing imbroglio) with fiction (House of Cards) and the market (Viagra). The frame packages the real with the bizarre. Should make for a great class discussion. This entry was posted in framing, journalism, writing and tagged American Indian, baudrillard, Indigenous Science, iran, native press, native science, politics, science communication, stereotypes, tom cotton. Bookmark the permalink.